Drawing something well requires understanding it. 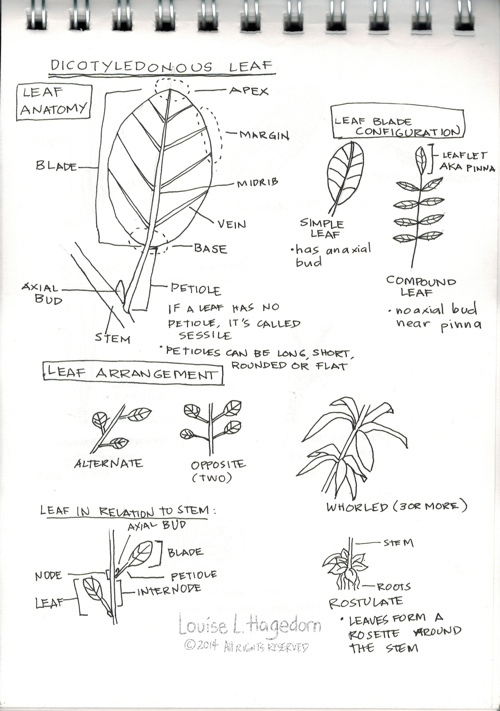 In order to understand leaves better, I checked on some botany sites and found what I needed. Plants are divided into two main groups, Angiosperms and Gymnosperms. Angiosperms are more commonly known as flowering plants. They include flowers, bushes, shrubs, grasses, and most types of trees. Their seeds will usually be protected by a fruit or an ovary. 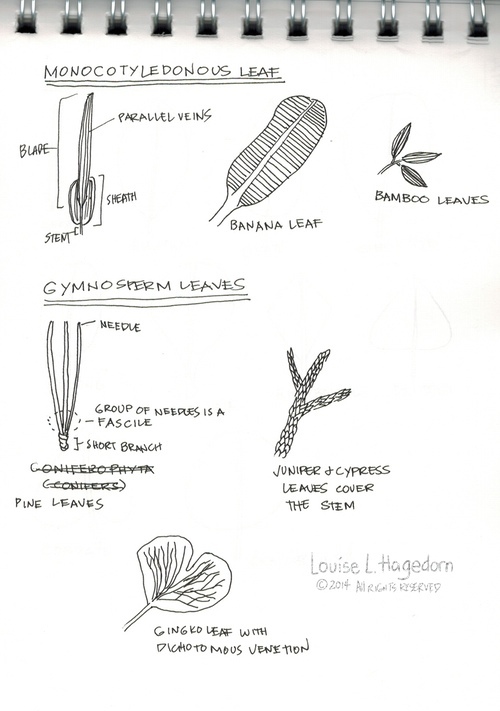 Gymnosperms have naked seeds. They include conifers, cycads, and ginkgo. Angiosperms can be further divided into Monocots (Monocotyledonous) and Dicots (Dicotyledonous). The differentiation between the two is based on many things, but in college, how I could quickly categorize it was from what the seeds of each type looks like. Monocots have one embryonic leaf, while Dicots have two. Most of the legumes we eat are dicots. Rice is an example of a monocot. Categorization has its own issues. Some plants have characteristics of both categories, but that’s information I find too complicated for today. Dicotyledonous leaves have net-like veins, a blade, and a petiole that connects to the stem. If they have no axial buds, the leaves are called sessile. They can be simple or compound leaves. Simple leaves will usually have a blade, a petiole, and an axial bud. If they are compound leaves, the leaflet, also known as pinna, will not have an axial bud near it, but the area near the petiole will have one. Both simple and compound leaves can have different arrangements on a stem. They can alternate, be opposite one another, whorl, or form a rosette. Monocotyledonous leaves have parallel veins. There is usually a sheath that covers the lower portion of the leaf. Gymnosperms leaves have three examples, conifers, junipers, and ginkgo. The most common example of conifer leaves are pine tree leaves. They are long, and have a sheath around the base. Juniper leaves look like small scales on a stem. Ginkgo leaves have a net venation that splits in the middle. 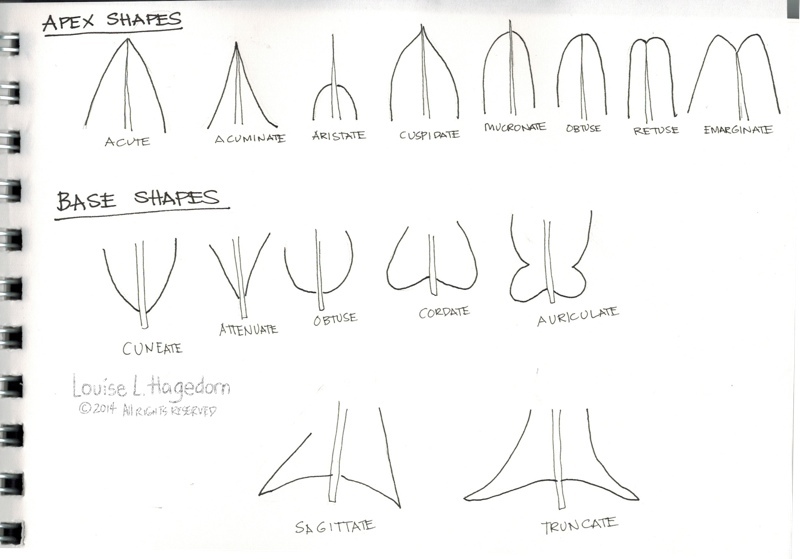 Leaves also come in different shapes. The leaf blade shape is the combination of the apex shape and the base shape. Think of all the possibilities!